It was still snowing hard in Turkey – Istanbul on the Bosphorus was trying to come to terms with the unexpectedly heavy snowfall. Everyone seemed to be having fun except the traffic police, quirky snowmen were popping up all over the place, each reflecting the creativity of its high-spirited sculptor. Snowball fights round every corner and traffic at a crawl. We abandoned the car and eventually got to Karaköy Güllüoğlu, home to the Mecca of baklava and related confections, to try to learn the secrets of this most Turkish of sweetmeats. We are warmly welcomed into a plush office lined with awards; glasses of Turkish tea and several types of baklava appear as if by magic. In the background a video on a loop plays segments from the many TV channels who have come from all over the world throughout the years to document the process. I’ve also come to watch how this flakiest of baklava has been perfected by six generations of the Güllü family and their loyal team of masters and apprentices. This extraordinary operation starts at 4am. It’s fascinating to get a glimpse of an operation where every single element has been studied to the enth degree, even the method of dishwashing, which is where everyone including family members starts their apprenticeship. The feather like phyllo pastry is made from a very specific variety of hard wheat flour, seasoned with salt, and then bound with egg, water and extra virgin olive oil. The texture of the dough varies according to the weather and humidity. The dough master has been honing his skill over several decades. Each ball of dough is hand rolled on unpolished marble tables with 1.6 metre long pear wood rolling pins, into 10 paper thin silky sheets. Even perfecting the skill of dusting the dough with a puff of corn starch takes an average 18 months to achieve. It takes about fifteen minutes to roll and is quite mesmerising to watch. Suddenly everyone stops rolling, bows deeply and utters a loud greeting, the baklava master, Nadir Güllü has arrived, he’s been held up by the snow. The baklava is baked in heavy rectangular trays that are first brushed with melted butter, then 10 layers of phyllo are spread evenly one by one over the base. A little sprinkle of melted butter on each from a special brush made from the male kamis bush. Then a generous layer of coarsely ground pistachio or walnuts followed by ten more feather-light layers. The walnuts, all best quality and pistachios come from Gaziantep, the home town of baklava in South East Turkey where according to Nadir, 90% of all baklava makers come from and 10% of the entire crop is used to make baklava. 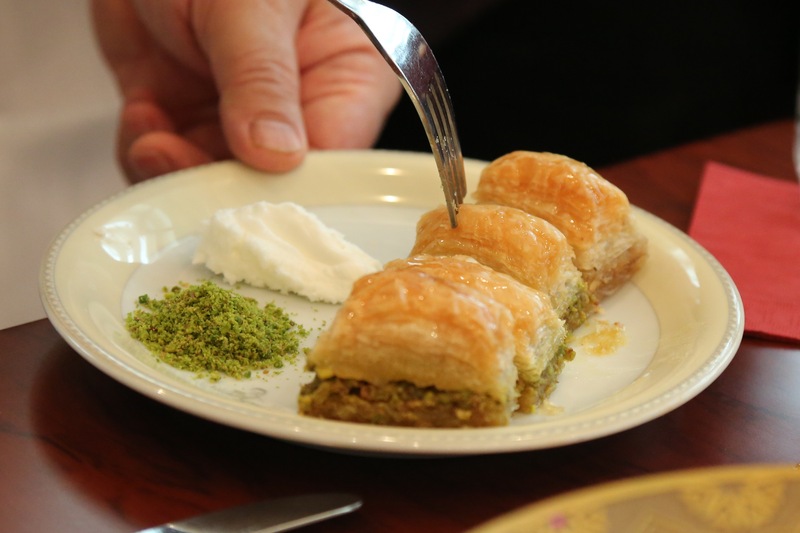 The edges are tucked in and then the baklava is cut into strips with a special knife. Melted butter is poured from top to bottom, then it is cut again into the familiar sized rectangles. The special sheep’s butter comes from Urfa near the Syrian border. The baklava rests for a few minutes before being baked at 165 centigrade for 15 minutes. Next the all-important syrup, for 35 years one of the syrup master has been in charge of making the syrup, it’s made from a particular type of cane sugar to a very specific density and is ladled evenly over the hot baklava. The exact amount will be soaked up by the 20 separate layers of phyllo. Karaköy Güllüoğlu bakery has also been making a gluten free baklava with stevia syrup for over 10 years. Turkish people have an intensely sweet tooth, of the 70 million population a reported 10 million suffer from diabetes. Around the bustling workshop, several other types of baklava were being made, a pistachio log rolled on a metal rod and then crinkled also looked irresistible, as did Nadirs burmas, little triangles filled with pistachio and semolina cream, there are also walnut versions which apparently are even more popular. Nadir, the sixth generation master is an affable, hugely entertaining guide, totally passionate about his craft and the power of eating together to promote peace. We went back to his office so he could show me the correct way to enjoy baklava. Upstairs there were queues of people waiting patiently to buy the confections. Many shops are supplied from this busy bakery where each and everyone is so proud to have brought baklava to an art form. Turn into a colander and drain and cool. Mix the crumbled Feta and grated cheese with the beaten egg. Add the well-drained spinach, taste and correct seasoning. Purée in a food processor for a smooth texture, otherwise use immediately as a more robust filling. To assemble lay one sheet of filo on the work top, brush with melted butter. Lay a strip of filling about 2.5 cm thick along the long side of the sheet of filo, about 2.5 cm (1 inch) in from the edge. Roll up and bend into an accordion shape and then roll up into a ‘snail’. Put the ‘snail’ on the buttered baking sheet, continue to make more ‘snails’ with the rest of the filo and filling. Brush each one with egg wash and then with melted butter. Bake in a preheated moderate oven 180°C/350°F/Gas Mark 4 for approx. 30 minutes or until crisp and golden. Serve immediately. This filling may also be used to fill a pie, double the quantity. Use a 9 x 28 x 8 cm (15 x 11 x 3 inch) tin. Use 6-7 layers of buttered filo to line the tin and another 6 or 7 sheets on top. Egg wash, brush with melted butter and score the top of the pie into diamond or square pattern. Cook in a preheated moderate oven 180°C/350°F/Gas Mark 4 for 45 minutes approx. Serve warm, cut into diamonds or squares. This is our friend Mary Jo McMillin’s version of baklava made with filo pastry, not quite as light as Nadir’s version but nonetheless delicious. Mix sugar and water over medium heat until dissolved. Add orange peel, cinnamon stick and boil gently for 20 mins or until syrup coats the spoon. Remove from heat, add honey and lemon juice. Set aside to cool. Mix nuts with 2oz of castor sugar, ground cinnamon and cloves. In a swiss roll tin, first brush the bottom with clarified butter. Layer in filo sheets brushing each with butter and folding in the over hang. Lay next sheet at the edge of the folded over hang and continue layering – brushing with the butter until you have built a base using 3 sheets. Sprinkle a generous handful of the nut mixture over the buttered filo. Top with 2 sheets of filo buttering each layer. Sprinkle over more of the nuts and continue in the same way using the nut mixture. Continue to use all remaining filo, brushing each one with butter. Make sure top layer has no seam. Chill for 20 minutes. Using a very sharp blade, cut the pastry all the way to the bottom into 24 squares and then into 48 triangles, if desired. Spear each piece with a whole clove, if using. Spray mist with water before baking, to prevent top layer from curling. Bake Baklava in a pre-heated oven 180°C/350°F/Gas Mark 4-190°C/375°F/Gas Mark 5 for 20 mins. Reduce heat to 150°C/300°/Gas Mark 2 and bake for 45-60 mins longer or until golden. Immediately upon removing from the oven, pour over the prepared syrup cooled to room temperature. Heat the oven to 210°C/410°F/Gas Mark 6 1/2. Brush a low edged baking tray, roughly 28cm x 37cm (11 x 15 inch), with some of the melted butter. Spread a filo sheet on top tucking it into the corners and allowing the edges to hang over. Brush all over with butter, top with another sheet and brush with butter again. Repeat the process until you have seven sheets evenly stacked, each brushed with butter. Place the ricotta and goat’s cheese in a bowl and mash them using a fork mixing them up well. Spread over the top filo sheet, clearing 2cm (3/4 inch) border around the edge. Brush the surface of the cheese with butter and top with the remaining seven sheets, brushing each in turn with butter. Use a scissors to trim about 2cm (3/4 inch) off the edge but without reaching the cheese so it stays well sealed within the pastry. Use your fingers to gently tuck the filo edges underneath the kellaj so you get a clear and neat edge. Brush with more butter all over. Use a sharp knife to cut the surface into squares, about 7x7cm (3 x 3 inch), allowing the knife to almost reach the bottom but not quite. Place in the oven and bake for 25-27 minutes, or until golden and crisp. Prepare the syrup while the kellaj is in the oven. Put the water and sugar in a small saucepan and mix it well with a wooden spoon. Heat up and once it boils, add the lemon juice and simmer gently for 2 minutes. Remove from the heat. Slowly pour the syrup all over the Kellaj the minute you take it out of the oven, making sure is soaks in evenly. Leave to cool for 10 minutes. Sprinkle the crushed pistachios on, if using, and cut into portions. Serve warm. 23-25.5cm (1 x 9-10 inch) round tart tin, preferably with pop-up base. Brush the tin with melted butter, cut 3 sheets of filo in half widthways, brush with melted butter, fold in half and arrange overlapping in the tin. Peel and cut the apples into chunks, sprinkle with plenty of sugar and cinnamon or mixed spice if using, the tin should be generously filled with fruit. Fold the edges of the filo back into the tart. Divide another 3 sheets of filo into 4 pieces each. Brush with melted butter. Scrunch up each piece and arrange on top. Bake in a pre-heated moderate oven 180°C/350°F/Gas Mark 4 for 1 hour approx. or until the apple is cooked and the pastry crisp and golden. Dredge with icing sugar, serve warm with softly whipped cream. Get Buzzing! Beekeeping for Beginners on Saturday 21st March 10am to 4.30pm, price €70 – the Irish Seed Savers Association in Capparoe, Scarriff, Co Clare, will hold a one day workshop. Topics include: Introduction to Honey Bees and their behaviour, how to get started, equipment needed and where source it. Local Bees and the importance of our Native Irish Black bees, what to expect during the beekeeping year (which will include managing some diseases.) To book and more information on year round workshops www.irishseedsavers.ie or phone 061 921866. 2015 is the International Year of Soils. Klaus Laitenberg will talk about Caring for Our Soil, at the GIY monthly meeting in Skibbereen on Monday 9th March at 8pm in the West Cork Hotel. All are welcome and donations are appreciated. For more information phone Marian 087 9972899 or see www.giyinternational.org. TRADEIT, who support small to medium sized traditional food producers, working within the dairy, meat or bakery sectors are running a face to face networking event, in collaboration with Enterprise Europe Network, alongside the ANUGA FoodTec trade fair in Cologne 26th to 27th March 2015. This event is for small food producers and the companies, get the latest information about keeping food businesses sustainable, for more details see www.b2match.eu/tradeitfoodsustainability.